:southern exposure on oversized corner lot, light & bright, quiet location w/ charming yard, architectural details, crown molding, upgraded flooring, built-ins, enlarged marble and saturnia master bath, upgraded cabinets, pool & spa custom home in a beautiful tropical setting on an oversize corner lot with a variety of custom landscaping. 3+den, open bright and sunny flr. Plan with southern exposure on pool and patio. Designer decorated features include custom built-ins for family rm. & den, beautiful window treatments, millwork in dining room. 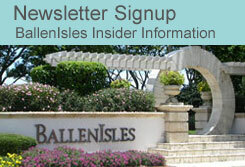 Buyer can choose any membership ballenisles has to offer.